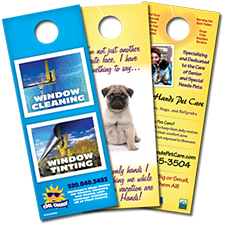 Door hangers can be a great way to promote your business or product. Bargain Printing now offers standard 4.25" x 11" door hangers printed on thick 16 pt card stock for maximum impact. Full-color door hangers can be single or double sided. Order as few as 500 or as many as 100,000 and get them printed and delivered quickly. Our standard tear-off cards include 1 straight perforation 2 inches from the bottom edge.